This wallpaper shows Himeno as White Pretear in sitting in the water deep in the forest. This image originally came form a scan (I think it was an easter egg from preteardvd.com) of one side of the Japanese DVD Boxset. Basically, I used the cloning tool to CG the empty background, the custom-made flower brush tool for the hint of leaves and lots of filters. This 1 of 3 of "Forest of Pretear" wallpaper series. Amazing images! I love the colour schemes, too. There's something about the mottled background that's enchanting. Okay, One comment coming up. First off I like the extraction of character. She came out very nicely. The background looks simple but subtle with lots of flowers. The water effect is nicely done too. I can't give you technical critque but I sure can say I love your work. Thanks much for posting. oh"" It 's so cool >>> I like your wallpaper and color . It has good feeling. I love the green on this wallpaper. Very pretty. 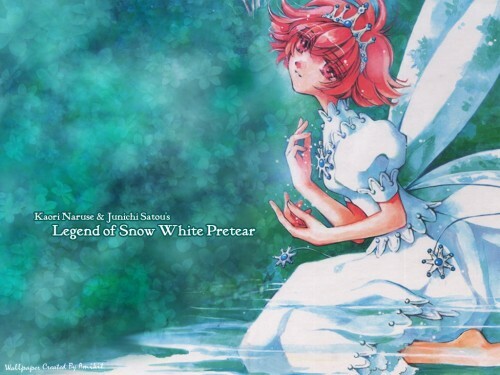 ^.^ Also a lovely image of Pretear. another pretear fan! i am delighted to meet you! Lovely wallpaper, himeno rocks!